The are several Palazzi (Palazzo Asmundo, Butera or Lanza) from where you can observe the procession of Santa Rosalia in total relaxation, in front of a glass of champagne or a delicious Sicilian course, removed from the intense crowd of townspeople. The “Festino” is the most important feast in Palermo tradition, a staff of people work all year long to deliver the next edition. Each edition (we celebrated the 394th edition this year) is dedicated to something different and culminates with the grand procession-show of 14 July. A special religious float is commissioned to a well-known artist and huge crowds of citizens and tourist follow it through the Corso Vittorio Emanuele. The procession-show of July 14 is a real festivity in between devotion and folklore, every year a lot of people come to Palermo to assist to the performances, music and dances live shows and of course, the amazing final fireworks show and the procession in Rosalia’s honor on the 15th. Experience a full immersion in the stunning “Santa Rosalia’s Festino”, whether you are a believer or not, you will fall in love with it. 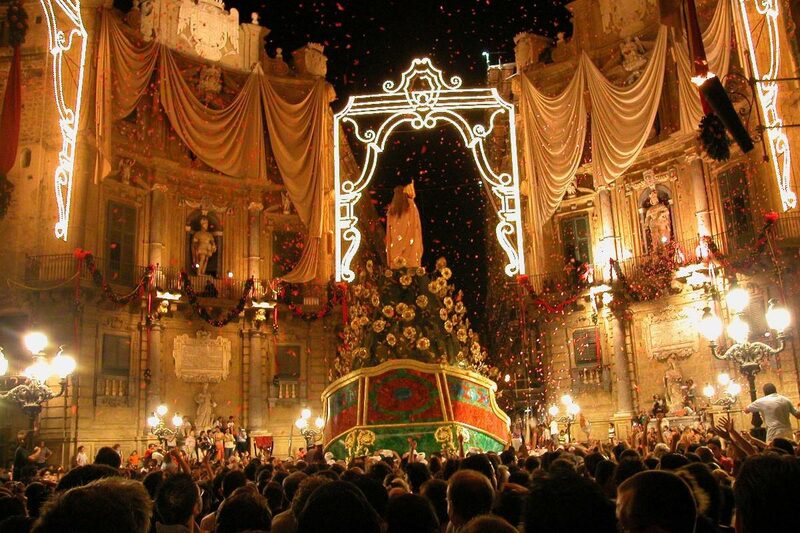 Feel the authentic soul of Palermo made of religious and pagan rituals that mix together in a modern Baroque feast that will take your breath away. The procession can be observed as it comes down the entire length of Via Vittorio Emanuele from the same palace or from different ones, in order to always have the better view and also enjoy the spectacular fireworks display that crowns the festivities.